NEW YORK (AP) — It's official: "Crazy Rich Asians" is a box-office sensation. 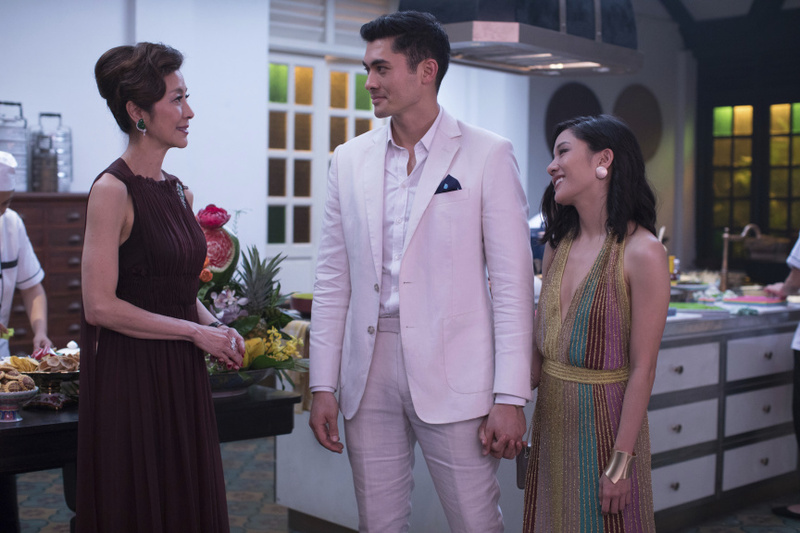 The adaptation of Kevin Kwan's bestselling novel, starring Constance Wu and Henry Golding, brought in almost as many moviegoers in its second weekend as it did over opening weekend. The Warner Bros. release grossed $24.8 million in ticket sales, according to final figures Monday, a tiny drop from its $26.5 million debut the previous weekend. Second-week drops are more commonly closer to 50 percent. Warner Bros. has said a sequel is already in development. 1. "Crazy Rich Asians," Warner Bros., $24,808,202, 3,526 locations, $7,036 average, $76,617,149, 2 Weeks. 2. "The Meg," Warner Bros., $12,812,615, 4,031 locations, $3,179 average, $105,083,261, 3 Weeks. 3. "The Happytime Murders," STX Entertainment, $9,532,425, 3,256 locations, $2,928 average, $9,532,425, 1 Week. 4. "Mission: Impossible - Fallout," Paramount, $8,087,385, 3,052 locations, $2,650 average, $193,988,045, 5 Weeks. 5. "Mile 22," STX Entertainment, $6,366,042, 3,520 locations, $1,809 average, $25,506,996, 2 Weeks. 6. "Disney's Christopher Robin," Disney, $6,261,783, 3,394 locations, $1,845 average, $77,550,566, 4 Weeks. 7. "Alpha," Sony, $6,002,359, 2,719 locations, $2,208 average, $20,562,933, 2 Weeks. 8. "BlacKkKlansman," Focus Features, $5,098,405, 1,914 locations, $2,664 average, $31,791,945, 3 Weeks. 9. "Slender Man," Sony, $2,790,564, 2,065 locations, $1,351 average, $25,408,680, 3 Weeks. 10. "A.X.L.," Open Road, $2,782,017, 1,710 locations, $1,627 average, $2,782,017, 1 Week. 11. "Hotel Transylvania 3: Summer Vacation," Sony, $2,541,668, 1,802 locations, $1,410 average, $158,659,057, 7 Weeks. 12. "The Equalizer 2," Sony, $2,032,245, 1,914 locations, $1,062 average, $98,052,577, 6 Weeks. 13. "Mamma Mia! Here We Go Again," Universal, $2,000,880, 1,557 locations, $1,285 average, $115,355,990, 6 Weeks. 14. "Ant-Man And The Wasp," Disney, $1,791,836, 1,178 locations, $1,521 average, $211,458,535, 8 Weeks. 15. "Incredibles 2," Disney, $1,642,506, 1,060 locations, $1,550 average, $597,055,472, 11 Weeks. 16. "Papillon," Bleecker Street, $1,090,073, 544 locations, $2,004 average, $1,090,073, 1 Week. 17. "Spy Who Dumped Me, The," Lionsgate, $1,010,334, 1,295 locations, $780 average, $32,288,476, 4 Weeks. 18. "2001: A Space Odyssey IMAX," Warner Bros., $857,911, 319 locations, $2,689 average, $857,911, 1 Week. 19. "Jurassic World: Fallen Kingdom," Universal, $741,610, 608 locations, $1,220 average, $413,010,305, 10 Weeks. 20. "Beautifully Broken," ArtAffects, $582,152, 651 locations, $894 average, $582,152, 1 Week.